For use in un-occupied areas in the home, such as garages, attics, crawl spaces, sheds and basements. Controls pests in raw grain bulk storage and garbage collection areas. 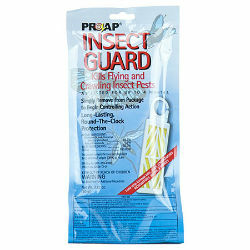 Controls insects up to 4 months. One Insect Guard strip treats up to 1200 cubic feet through vapor action. Easy-to-use pest strip controls flies, gnats, mosquitoes, & moths in homes, barns, stables, tack rooms, kennels, and other farm buildings. Great for Deer Blinds! Not for use in areas in which humans are present for more than 4 hours at a time.